Robert Wood is believed to be one of the first African American mayors in the United States. He served as mayor of Natchez, Mississippi in the early 1870s. Wood was born in 1844 to Susie Harris, an African American housekeeper, and Dr. Robert Wood, a white doctor from Virginia. His parents never married, but lived side by side. According to oral histories, Wood was never a slave and lived mostly with his father, a former mayor of Natchez himself. Mississippi Governor James L. Alcorn appointed Robert Wood as mayor of Natchez, Mississippi in 1869. He later was elected mayor in 1870. His election was part of the “Black and Tan Revolution,” a short-lived political shift in Mississippi in which citizens of Mississippi elected many African Americans to state offices between 1868 and 1875. At its peak in 1873, half of Mississippi’s state elected officials were black. 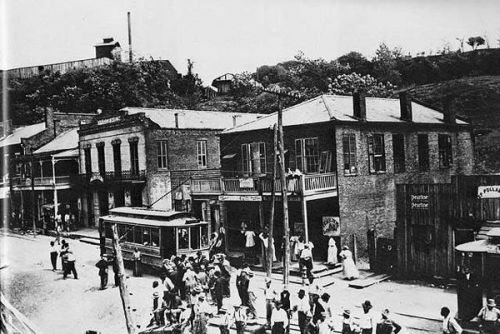 As mayor, Wood built Natchez’s first school for African Americans in 1871. Wood also worked closely with John R. Lynch, the Congressman representing the area during the Reconstruction era. Both Wood and Lynch worked as printers at a Natchez printing company prior to their political careers. After his term as mayor of Natchez, Wood served as postmaster and tax collector for the city. In 1875 Wood was elected Sheriff of Adams County, Mississippi. After his political work, Wood operated a store in Washington, Mississippi, a town three hours north of Natchez. He lost much of his property during a fire in Washington. Wood married Susan Collins and had two children, both daughters named Selma and Stella, both of whom were baptized at St. Mary’s Cathedral in Natchez, Mississippi. The date of Robert Wood’s death is unknown. David Duncan Collum, Black and Catholic in the Jim Crow South: The Stuff that Makes Community. (Mahwah, New Jersey: Paulist Press, 2006); Mike Brunker, “Race, Politics and the Evolving South: A Black Mayor, 130 Years Later,” http://www.nbcnews.com/id/5676325/, Aug. 17, 2004.